Water's Edge at the Cove Condos Coming Soon! Register Now! Water's Edge at the Cove is a new condominium development currently in pre-construction located at 2163 Lake Shore Boulevard West in Toronto, Ontario by The Conservatory Group. This is "ultimate in lakefront living" located right behind the 17-storey Cove at Waterways Condo along Marine Parade Drive. 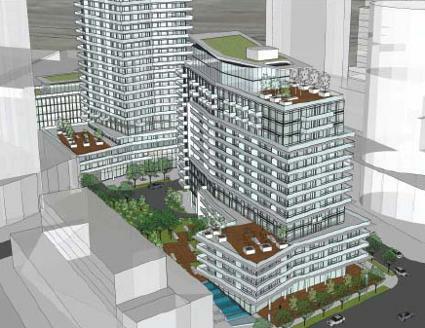 Water's Edge at the Cove Condos is a proposed 56 storey residential building designed by E.I. Richmond Architects Inc. This is still early in the proposal stage so the height of the tower may still change. 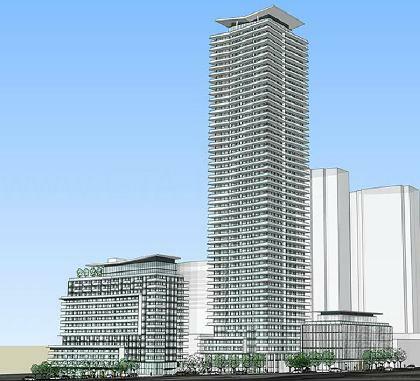 This new development will have lakefront views from the higher floors looking onto the Humber Bay. Located south of the Gardiner Expressway in the Humber Bay Shores neighbourhood where many new condominiums have been built and many are still under construction along Marine Parade Drive and Lake Shore Boulevard West. A tranquil and majestic area along the water's edge where residents can enjoy a nice stroll or bike ride along the Humber Bay Park trails. Situated right by the water as well as parks such as the Humber Bay Shores Park, Palace Pier Park, Jean Augustine Park and Humber Bay Park East. 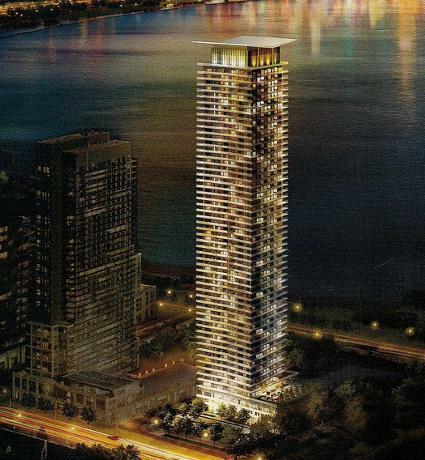 Water's Edge Condos is also located near the Humber Bay Bridge leading into Sunnyside Beach. This new proposed development is also situated near High Park which is about 400 acres in size where families can enjoy recreational activities, yearly events, playgrounds, picnic areas, gardens, sporting/cultural and educational facilities, a zoo and the cherry blossoms that attract many visitors each year to his park during spring time. Water's Edge at the Cove is being developed by The Conservatory Group who is a real estate developer that has been in business for over 50 years and is "one of Canada's largest builders of fine luxury condominium communities". Their projects can be found all across the Greater Toronto Area such as downtown Toronto, Mississauga, Thornhill, North York, Scarborough, Brampton and Ajax. The Conservatory Group has constructed and sold more than 30,000 residences thus far. One of their projects is the Cove at Waterways Condos which is located right beside the new proposed Water's Edge at the Cove Condos and is a new condominium development currently under construction and is selling with 17 storeys and 281 units scheduled to be completed in Spring of 2017. Available unit size range from 460 square feet to 1,093 square feet with prices for available units starting from $279,900. Amenities include a party room, exercise room, outdoor BBQ area, concierge, boardroom, pet grooming room, outdoor lounge and guest suites. Water's Edge at the Cove is being designed by Toronto-based architectural firm, E.I. Richmond Architects Inc. They have been in business since 1992 specializing in retail, commercial, institutional and condominium buildings and their services include planning, design development and contract documents. Some of the their projects include Parkside Village in Mississauga, Beyond the Sea in Etobicoke, The Modern on Richmond Street in Toronto and many many more. 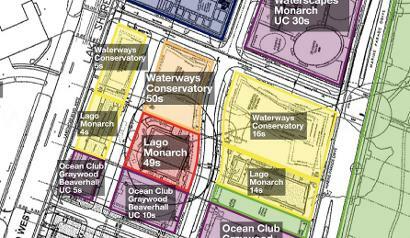 Register with us today for more information on the Water's Edge at the Cove Condos by The Conservatory Group! Water's Edge at the Cove Floor Plans and Price List will be available soon. Please call or complete the registration form to get all the info and to register now for the Platinum VIP Preview Sales Event. 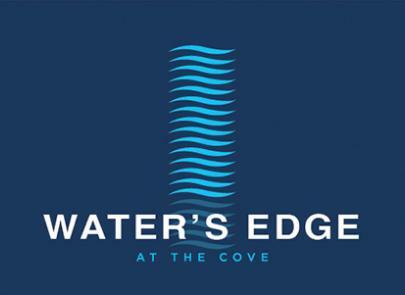 For more information, please register today for the Water's Edge at the Cove Condos.